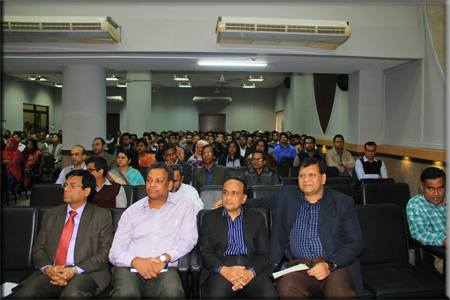 A knowledge dissemination workshop on PKSF’s `Gender Policy’ and `Policy and work plan to create a favorable atmosphere in the workplace with regards to give protection from possible sexual harassment of employees’ was held on 15 December 2016, at 3:00pm, at PKSF auditorium. Mr. Md. 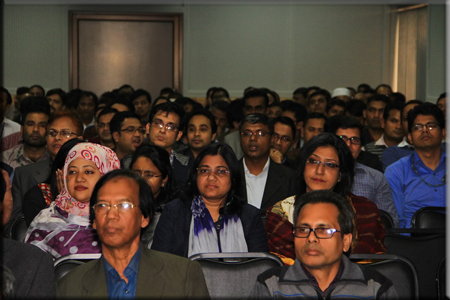 Fazlul Kader, Deputy Managing Director, PKSF provided the introductory speech of this workshop. Dr. Qazi Kholiquzzaman Ahmad, Chairman, PKSF and Mr. Md. Abdul Karim, Managing Director, PKSF graced the workshop with their presence. Ms. Hasna Hena Khan, General Manager (Social Development and Advocacy) gave a presentation on the `Gender Policy’ which was approved by the Board of PKSF on 11 May 2016. Whereas, Ms. Tanvir Sultana, Asstistant General Manager (Training) presented the overview of `Policy and work plan to create a favorable atmosphere in the workplace with regards to give protection from possible sexual harassment of employees’, which was approved by PKSF’s Board on 29 June 2015.